Lots of gulls over the Countryside Landfill in Lake County, Illinois today, but none in the parking lot when I arrived. It took a lot of work to finally get a sizable group to put down at the Lake County Fairgrounds (proper). Between 10:00 a.m. and 1:30 p.m. we tallied 6 Thayer's Gulls (5 ad., 1 3rd cycle), 3 Kumlien's Gulls (ads.) and 1 Great Black-backed Gull (1st cycle). I also spotted a banded 2nd cycle Herring that I was able to record. Thayer's Gull (3rd cycle). Lake County, IL. 16 Feb 2015. Thayer's Gull (3rd cycle with similar aged Herring). Lake County, IL. 16 Feb 2015. Adult Thayer's Gull with all-white tip to p10 and no mirror on p9. Lake County, IL. 25 Feb 2015. An intermediate adult Thayer's/Kumlien's Gull. Lake County, IL. 16 Feb 2015. One of the smallest and shortest-legged adult Ring-billeds I've seen. Lake County, IL. 16 Feb 2015. Here's another Herring that one might easily mis-age without an open wing (open wing below). 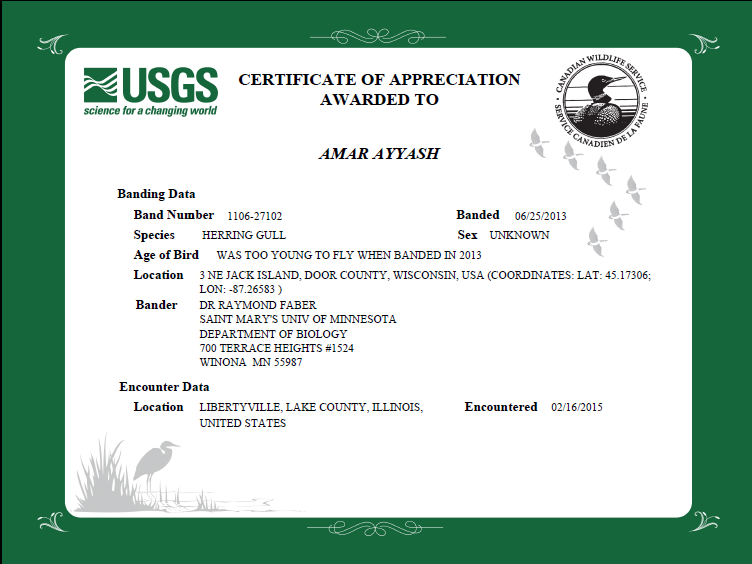 Herring Gull (2nd cycle type). Lake County, IL. 16 Feb 2015.